This week, I attended the Rickmansworth Writer’s Group at Costa Coffee – in Rickmansworth. I had always wanted to attend a writing group, so when I saw this group advertised locally, I seized the opportunity. It was wonderful to meet other writers – to share, read and discuss written works. The first task on the agenda had been a ten-minute ‘warm-up’ writing exercise. Mike had showed us a photograph of a man lying on his back, on a lawn; holding and looking through a camera. Half of the image had been purposely concealed with a piece of paper. Mike had said to us ‘Describe what you think might be happening in the picture. Now write for ten minutes.’ Having gazed at the photograph for a few seconds, we had then taken to our pens and paper. The goal had been to write with imagination; to produce a free write narrative, a poem, a flash fiction, a short story – or any other literary form that had inspired us at that moment. I wrote a flash fiction called ‘Balloon’. His hands twist around the camera. Through the lens, he searches a great perspective. On the horizon he sees a hot air balloon, floating in the sky. He is left unsettled, for in the basket stands a boy; he is smiling, waving back through the lens, from miles. The boy must have spectacular vision, he thought, for no human could possibly see me from this distance. Their eyes lock. He knows that the boy he sees through the lens is far from human. His blank eyes show it so. When the piece of paper had been removed, and the photograph revealed, it had shown a huge snake spiraled around the man’s body – its face peering directly, menacingly, into the lens. We had all chuckled at the odd discovery – it had been quite a different image from the ones we had imagined. Some of the visions that we had conjured had been dark, fun – some even pornographic! These pieces had not been shared with the group. We had then taken turns to read our own written works to the group. One of my own flash fictions called ‘Doppelganger’ had been critiqued, in fine detail – which was very eye-opening! The critique had taught me that each of us can, and often does, visualise written works quite differently from each other. That sometimes, the images the writer intends to portray through words can be quite different from the images that are conjured by the reader. My story had provoked a discussion about word choice in a narrative, and how one word can strengthen or weaken an entire piece. Words such as ‘darkening’ was mentioned as being strong– for it had portrayed an ever-changing environment – and if I were to have used the word ‘dark’ it could have had felt quite static. ‘Oddly’ was said to have been a strong word – and that it had a more powerful effect than the word ‘odd’. ‘Red-perfumed’ was deemed a weaker, hyphenated word; one of the readers had been unable to visualise the two words together as they had suggested two different ideas. ‘Attire’ was also said to have sounded formal in comparison to the other words within the sentence. I had been asked if my word choice had been intentional. My reply had been ‘they came out naturally at the time; and the selection of words would have been dependent on the mood I was in at the time of writing.’ Had I just left the office when I conjured ‘attire’? Had office work inspired my inner speech? This critique had highlighted to me, the importance of word choice; that it is a very powerful element in writing – the correct word can make a piece of writing light up; the wrong word choice can diminish a piece into oblivion. Sinister, had been used to describe the overall feeling and tension in the flash fiction. I quite liked this comment, as it had fitted nicely into the genres that I write in. Flowing, had been used to describe the narrative style; mostly due to the similar sentence length throughout the piece. I had been asked ‘why does the protagonist want to go to Bates Motel?’ and ‘how could this possibly happen if it is a fictional place?’ I had not thought of any of these questions when I had written the piece – because my desire, my attention, my focus, had been entirely in trying to express the emotionally disturbed woman – and her longing to imitate an idol. Others had answered ‘it doesn’t have to be a real place’ and ‘it could be a dream’ – and I those answers summarize the essence of fiction; the writer does have the power, the freedom, to design his and her own worlds – wherever they may be. I had learned a lot from three questions – I will now try to read and view my own writing from the perspective of many different kinds of readers. I will try to imagine what questions a romance reader might ask about one of my horror stories – what questions a science fiction reader might ask in one of my thriller stories. I will learn to constantly ask myself ‘why’ – why am I writing that word, sentence, and scene? Am I expressing what I want to say in the best possible way, to the array of readers that are in our universe? At the end of the critique, a writer called Vivien Maier had been mentioned as being someone I might find inspiring. I have made a goal to research her this week. What a beautiful name she has! At this point in the session, we had a well-earned coffee break. I must say, a private meeting room inside Costa coffee is the perfect setting for a writing group – it conjures images of Paris and its café writers; smoking, sipping espresso, whilst writing in their notebooks – La bonne vie, darlings! Next a writer had read her poem. The ‘untitled’ poem had been about a woman, remembering her youth, grieving for her love, and finding consolation in a library book (in which she escapes from her hectic life). The poem had provoked both sad and humorous emotions in the readers – the sad parts had grown sadder – providing the reader with an increasing emotional punch. The first two lines had painted a setting, an atmosphere ‘dark, washed-out grey’. This had cleverly linked with the third line and the character’s depressed emotions. The poem had finished with a last line, and a clean closure. This had raised the question ‘Is it better to leave a poem, a story, open or closed? Some had favoured the open option, as this gave the reader room to complete the story themselves – also allowing the writer a pressure-free ending. Some had favored the closed option, as this gave the reader a concrete answer – and gave the writer contentment in that their work was received fully. I think both open and closed options have their advantages and disadvantages; I guess it all depends on the individual piece. We had then discussed authors that worked in a similar style to the poem. Some names that had been mentioned were; Sylvia Plath (The Bell Jar was referenced as being a favourite piece by one of the writers – an English teacher), Yeats, Sophie Hannah and Wendy Cope. Next, a writer read his poem. This poem had adopted a rhythmical beat – with every first and third line rhyming. It had played on themes of humour and patriotism. I had noted the choice of words in the poem, and how they had all contributed to the themes of the piece. Again it had made me think about how important word choice is in any written piece. The themes had worked perfectly with the uplifting rhymes. The writer had used a very dated word and had fused it with simplistic language – which I had found to be very effective. There had also been a very clever element to the poem. In one line we were made to laugh – then in the first word of the line that had followed we were made to read ‘laughing’ as a word. I found this a superb way to provoke emotion in the reader one minute, and then next, have the reader read a word describing that emotion. It had made me pause at that moment at the sheer genius of it! I may try this trick in one of my own flash fictions in the future. I’m not sure if this is a recognised literary technique or not? At the end of the critique, Tony Harrison had been suggested as a writer to research; based on their similar poetic rhyming styles. Next, a reader had read her short story. It had been highly descriptive, and we got to know the protagonist and other characters through narrative. It had been mentioned that dialogue could have strengthened the piece by bringing the characters to life through interaction. Weaving background into the ‘now’ of the story was also mentioned as a method of strengthening the piece – rather than overwhelming the reader with backstory before the story actually begins. It had made me think of the early stages of plotting outlines of stories – the method of juggling scenes and chapters around on cards. I find this a very creative way to play with a story. When the critiques had finished, we had each read a few passages from Raymond Carver’s ‘On Writing’ – new short story theories (Page 275). We had discussed the different methods that writers use; how some writers are content with free writes and numerous drafts – allowing the story to lead them; how other writers are avid plotters – visualising each scene so that they are in control of the story. I believe Agatha Christie had watched her entire novels play out in her mind before even picking up a pen! We had also discussed how different ages, deadlines, and academic teaching also have an impact on the way we write. The truth was, every writer has their own methods of writing – there is no right or wrong way. Also, the writing world is constantly evolving – and the methods we love one day may be abandoned the next. During the end of the session I had been asked what I thought about flash fiction as a form of writing. I had answered with ‘It’s a great way to get a story completed quickly – unlike a novel which can take months, years.’ I also mentioned the word ‘brevity’ – the cutting of non-essential words – and that I believe this is an essential part of the form. I expressed that without brevity we are merely rambling – and not producing flash fiction at all. In those several hours I felt I had learned and achieved much. I had created a written piece in ten minutes. I had offered advice and received advice on writing. I had found confidence in reading aloud. I had discovered new writers, and new ways to analyse written works. The session had also brought back good memories of college and University days. It had reminded me of how much I loved (and still miss) the study environment; it has that sense of belonging and purpose. And, this is why I intend to continue to attend the monthly sessions. 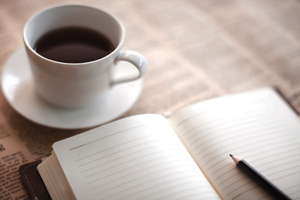 Have you ever considered joining a local writing or reading group? It’s a great way to meet like-minded people and improve your knowledge in the subjects.How about creating a group yourself? Until next time; happy reading and writing!